Home Personal Finance What Is the U.S. Debt Bubble and How Could It Affect You? What Is the U.S. Debt Bubble and How Could It Affect You? The Real Estate Bubble, The Stock Market Bubble, The Private Debt Bubble, The Discretionary Spending Bubble, The Dollar Bubble, The Government Debt Bubble. 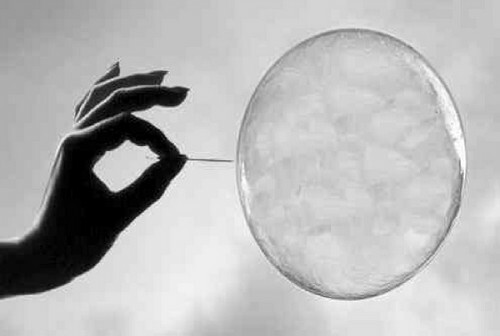 The National Media does an exceptional job of sugar-coating the state of our economy, our job at at Critical Financial is to keep you informed of what can and will eventually happen with respect to these bubbles. The print-money approach to the debt bubble will continue to drive up prices of items that you buy every week, from gasoline to eggs. That is because your dollars are worth less to the makers of these products. As the governmental debt continues to grow ($16 trillion and counting), prices of common items will continue to grow with it. This is especially bad news for those on a fixed budget, i.e Social Security. The U.S. debt also impacts your retirement plans, perhaps drastically. You can probably count on reduced benefits and dollar amounts that buy fewer goods and services, a true double whammy. That means that you will need to take your retirement into your own hands more than ever. It also might mean that you will need to work longer before you retire. As for personal debt, as homes continue to foreclose in your neighborhood, the value of your home will either slip or stay stagnant. This will slow the recovery of millions of Americans that are under water on their home values and force them to alter their plans. This will force them to hold on to their homes for several more years, when they would rather move and downsize. Student loan debt is skyrocketing, forcing many families to look at alternatives for higher education. The U.S. debt bubble might determine where your children attend college. Dreams of going to a prestigious school might yield to reality—the local community college, then State U. for the final two years. Credit card debt will continue to hamstring many families, and if you own a small business the reluctance of Americans to whip out their cards these days will hurt your profits. In addition, it is harder to obtain a loan for your small business than in previous years, making it more difficult to expand. If you own a business or have a vital stake in one, you have no doubt whatsoever that the U.S. debt bubble affects your enterprise every day of the year. And what if these remaining bubbles burst? It’s hard to say what will happen exactly, but every single person in the country will immediately feel the impact, from currency being seriously devalued to goods instantly costing much more than usual. This is what has happened in countries around the world, such as Greece and Spain. Developing world countries have often forced their citizens to accept serious devaluation of currencies. We will feel that sting, too, in the coming years when the US debt bubble bursts. In future posts we will discuss these bubbles in greater detail! © 2012 to 3914 Critical Financial. All rights reserved.